I have a mp4 video which is 18.5GB, it doesn't has any appreciable quality, and it runs for 2.40 hours. Recently I came across a movie which was saved in mkv format and was of the same time and better quality and it was only of 0.78GB. Can any suggest me how to convert mp4 into mkv? Is there any tool or program which I can use to convert MP4 to MKV, also I want insert subtitle on it. Due to the great compression rate and high compatibility, MP4 is widely seen on the internet, transmitted among users or played on mobile devices. But MP4 is still inferior to MKV when it comes to the video quality. This urges a high demand on video conversion from MP4 to MKV among users wishing a high quality video. For this purpose, the following step-by-step guide will help you convert MP4 to MKV in seconds using a MP4 to MKV converter. 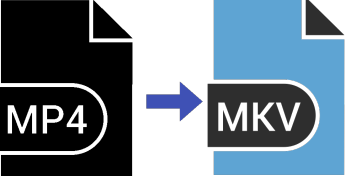 Actually, the workflow involving in MP4 to MKV conversion itself is fairly similar for all MP4 to MKV converters. What's matters when converting MP4 to MKV is the video converting performance and easiness. MakeMKV is pretty easy and enables you to freely encode files into MKV format, but the input is only limited to DVD and Blu ray. Handbrake is indeed a great free video converter that can convert any videos to MKV and MP4 formats but problems with Handbrake such as Handbrake stops encoding, A/V sync error may distress you constantly. While Any video converter will be lengthy in converting MP4 to MKV or other format, almost twice as slow as Handbrake when converting a 4K 4-minute video. No bother anymore. Your best bet is the simple, fast yet functionally complete MP4 to MKV converter - MacX Video Converter Pro (Windows Version). It enables you to convert MP4 to MKV format with no problem yet maximally preserving the quality. The trump card of the MKV video converter is that it has the knack for converting videos from MP4 to MKV at the shortest time, thanks to its hardware encoding tech, Multi-Core CPU and hyper-threading tech. 1. Built in 370+ video/audio codecs, it allows you to convert among HD and SD videos, e.g. MKV to AVI, FLV to AVI, MP4 to WebM, MP4 to MPG, MTS to MP4, H265 to H264, etc. 2. High-quality engine, multi-core CPU, hyper-threading and hardware encoding techs ensure the highest possible quality and fast video converting speed, 5X faster than other converters. 3. 400+ readymade profiles offer easy conversion from videos to the latest mainstream devices, ranging from iPhone 7 to Samsung Galaxy S7, PS4, Surface Pro, Windows phones. 4. The MP4 to MKV converter also features high compression ability to compress 4K to 1080p or other smaller-sized format in a few clicks. 5. It is available for you to crop videos, trim videos, add watermark or even add subtitles to MKV with ease. 6. It lets you download videos from YouTube and other 300+ video sites with ease. 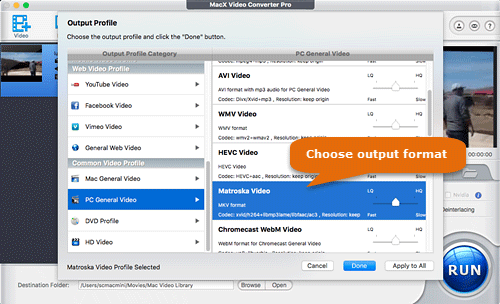 Free download the MP4 to MKV converter on Mac. Or get its windows version downloaded on your PC for specific conversion from MP4 to MKV. Then add MP4 video by dragging and drop it or directly click the Add Video button. Note: batch conversion is supported. You can converting more than one MP4 video into MKV format. Go to PC General Video and Choose Matroska Video from the Output Profile. You can move the slider to LQ or HQ to either get the fast MP4 to MKV converting speed or obtain the highest possible quality. We highly recommended you to keep it unchanged as the default setting keeps good balance between file size and quality. Optional: Do some parameter adjusting for your specific purpose. You can higher the frame rate and bit rate to get better MKV output quality. But bigger bit rate will lead to larger file size. Click Browse button to set the destination folder to save the output MKV video. Then click RUN button to kick off the MP4 to MKV conversion on Mac or Windows. What is MP4: MP4 is the most famous format commonly used for storing data like subtitles, video, audio and images. MP4 files are commonly seen when you download a video from internet or use DVD ripping software to save the movie to computer. What is MKV: MKV supports several types of audio, video and subtitle streams, which is highly acclaimed for storing a complete movie with subtitles in a single file yet preserving the highest possible quality compared with other formats like MP4, FLV, AVI, etc. How to play MKV on Mac:If you download HD video files in MKV and want to play them back on Mac's QuickTime player, you may notice that the MKV files play very choppy, even when you use VLC player or MPlayer. You must do some settings: Go to QuickTime Preferences/Advanced/MIME setting > click on Video and it's last on the list. If it is still unsolved, please use the MKV converter to convert MKV to MP4, MOV or M4V QuickTime recognizes to get it worked. Sought-after MP4 to MKV video converter - MacX Video Converter Pro provides you the easiest way to convert MP4 to MKV, MP4 to FLV, MKV to MOV and more with original quality reserved and world's No.1 fast speed.